On browsing this site, I noticed that as well as the well known AME & BigMig engines, NV are offering a diesel conversion head for the .049 and .061. This was shown on the site as being "under development", and a link to register interest in it was provided. Having previously experimented with Cox & Norvel diesel conversion using a Davis head, I was keen to give the NV conversion a go. My previous experiments with a dieselised BigMig .061 were only moderately successful, although I did succeed in flying a small control line stunter with a Davis converted Norvel. 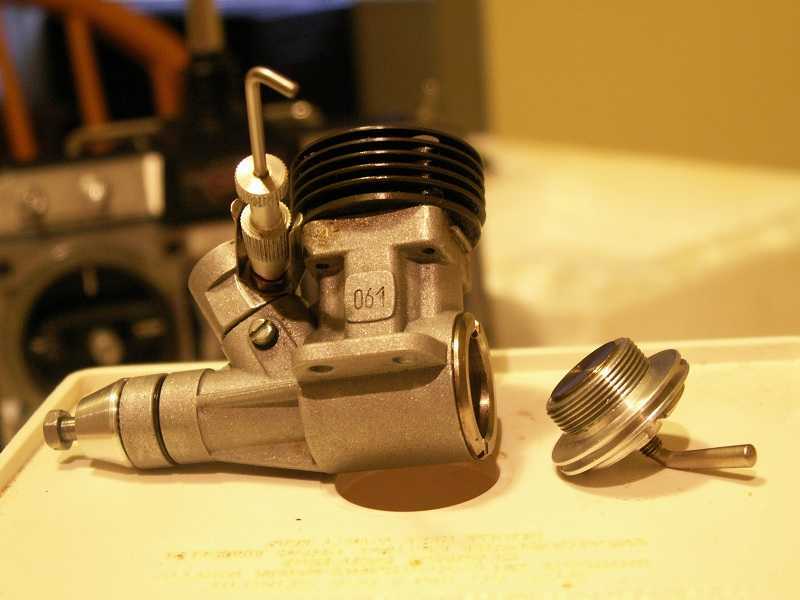 I found the .061 with the Davis head difficult to start (even with a spring starter), and performance was modest. On the positive side, it was amazingly quiet. 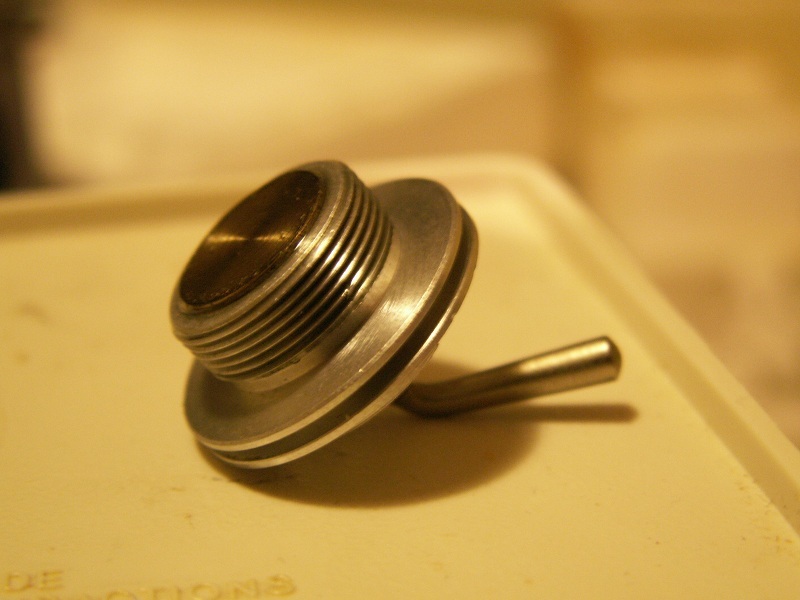 The Davis head seals using an unconventional combination of a teflon disc and an optional aluminium disc. This arrangement proved to not be very robust, burning out and needing replacement on nearly every bench run. In the air it lasted somewhat longer, but still failed after only a few flights. Interestingly, I found the Davis head worked much better on a Cox TD 049 than in a Norvel, with easy starting & adjusting. I therefore had written off the BigMig .061 as being unsuitable for diesel operation, and having run out of teflon discs set aside the Davis head as something of a curiosity. Then NV launched their new website, with the announcement of their conversion head. The images on the NV site showed their head to be a unit employing a conventional contra-piston & compression screw, without any teflon discs or rubber O-rings. I contacted NV to inquire about availability of the diesel head, and received a prompt response from a sales rep. I was offered a pre-production diesel head to review and provide them with feedback, on the basis that if it was unsatisfactory I could have my money back. I also ordered some other parts for my small fleet of Norvels at the same time. My order arrived promptly, delayed only by the 5 day Easter & Anzac Day long weekend. My initial impressions of the NV head are that it is a well made unit, with the typical NV "look & feel". Fitting the head was easy, as like the NV glow head it has slots which match a Cox or NV spanner. It was a simple matter of removing the glow head & screwing in the diesel conversion. On fitting to a BigMig .061, I found that to obtain an optimal compression seal it is necessary to use at least two copper head shims (either Cox or NV ones will do). With one or no shims there was a noticeable leak, but with two shims the compression seal is perfect. Flicking of the converted engine showed that compression was very crisp: it now felt like a diesel. The compression screw has a nice positive feel, with the contra-piston offering some resistance when increasing compression. 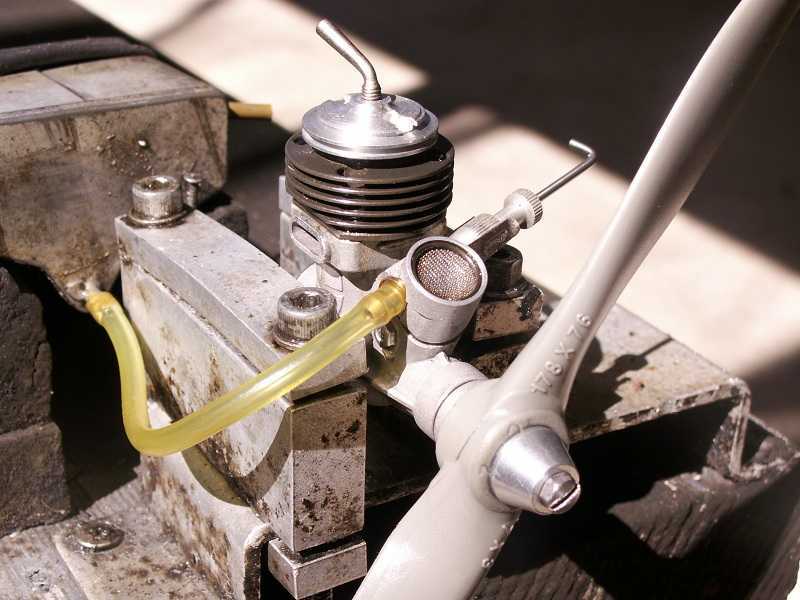 The contra-piston is neither excessively tight or loose, and will snap back if you over-compress the engine without fuel and flick the prop. At a more normal compression setting the contra-piston will not snap back without fuel present. The feel in this regard is directly comparable to a good PAW 06. Having examined the unit, the next step was to put it on the bench and see how it runs. I have now run a BigMig .061 with the diesel head, and consider it to be a success. I will be keeping the head & flying with it. The first run is with an APC 7x3 prop, which is the size prop I would normally expect to use for control line flying with a 1cc diesel. I have previously flown a friend's PAW 06 powered model with an APC 7x3, so this was the logical prop to start with. The second run on Youtube is with a Master Airscrew 6x3, which is at the upper end of what I consider to be viable props with it running as a glow. The fuel for these runs is a standard "plain bearing PAW" mix, which is 25% castor oil, 33.5% ether, 1.5% Amsoil Cetane Boost (2ethylhexyl nitrate) and 40% kerosene. This is my "default" diesel fuel, and I run all my diesels on this fuel. Performance of the .061 as a diesel was, in my opinion, outstanding. 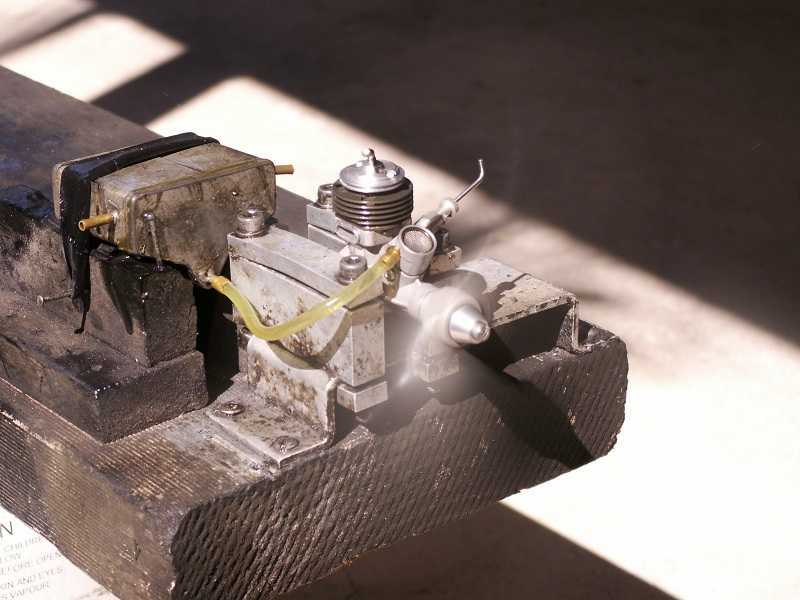 The initial starting procedure consisted of moving the prop until the piston closed the exhaust, then applying a drop of fuel to the side of the piston. I started with the compression wound out a fair way. Half a dozen flicks, adjusting the compression in after each flick, resulted in a burst. A second piston side prime & burst confirmed the setting. 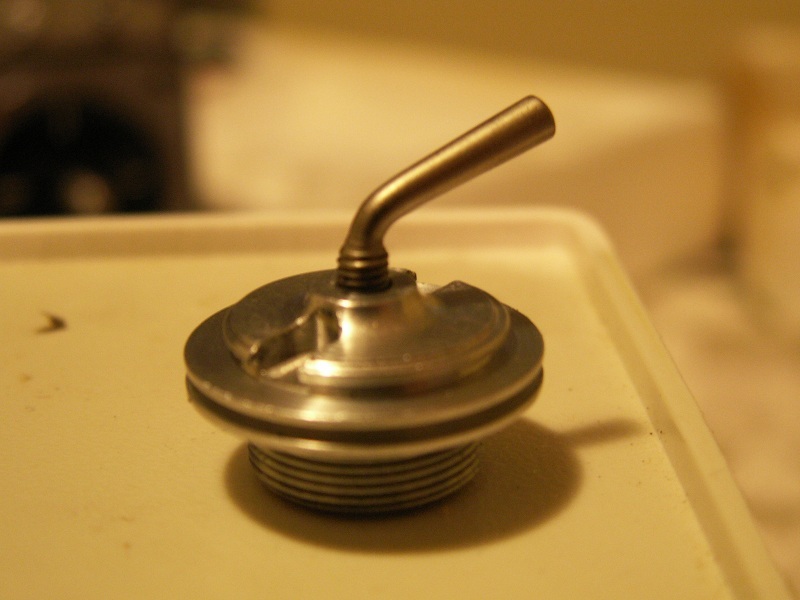 I then put about 30ml of fuel in the tank, opened the needle 3 turns, and choked fuel through. Another piston side prime and it was running after a few flicks. This started the engine running rich and a little under compressed. I then closed the needle and adjusted the compression in slowly until a peaked setting was found. The video was taken with the engine just a little off peak, further tweaking yielded a very steady and strong sounding 17,100 RPM with the APC 7x3. Higher revs up to 17,400 were briefly seen. This places the diesel converted .061 firmly into a range of performance normally associated with the Norvel .074, and is a good 1,000 RPM better than a PAW .06 with the same fuel & prop. I then switched to the Master Airscrew 6x3. Starting with the smaller prop was much more difficult than with the 7x3. I copped a couple of quite painful raps over the knuckle. With the 6x3, when it fires on a prime (or from choking), it is damn near impossible to get your flicking finger free in time, and I am used to the "diesel flick". After copping it a few times, I resorted to the "electric finger", and was able to get a run with a bit of perseverance. Even with the electric starter it was just not as easy to start as with a 7x3. Performance with the 6x3 once we did get it running was very good. Around 20,500 RPM, and I think 21,000 is achievable with a bit more running & better settings. The MA 6x3 is a fairly "high load" prop for a 6x3, on glow the engine turns it at around 18,500 so the diesel performance represents a gain of at least 2,000 RPM. The compression setting with the 6x3 was, as expected, about a quarter of a turn more compressed than with the 7x3. I disliked its starting behaviour on the 6x3 so much that I did not proceed to the small APC props I normally run the .061 on. For sports control line flying I typically prop them with an APC 5.5x2.5 (24,500 RPM with standard head) or an APC 5.5x2 (26,500 to 27,000 RPM depending on glow head used). I do not consider these very small props to be desirable for diesel operation, but wouldn't be surprised to see the engine equal or exceed its glow performance with them, assuming I can get it started! Having injured myself with the 6x3, I then went back to the 7x3 and explored starting & tuning behaviour. With the 7x3 back on, the excellent hand starting returned and I was able to get easy hand starts with the needle half a turn open from peak, a couple of chokes and some vigorous flicking. A small piston side prime makes hand starting even easier, but of course will be impossible with a muffler. When running, the compression adjustment works well, with a good positive feel. It does not tend to wind out when the engine is running, nor is the contra-piston so tight that it jams when the engine is hot. Adjusting the engine for optimal compression while running was easy. Once a good running setting is found, it is unnecessary to alter the compression again unless you change prop or fuel. I had no problem re-starting without touching compression, just by opening the needle half a turn. Behaviour in this area was much like traditional diesels. My only other comment about compression adjustment is that I do not particularly like the single arm compression screw, which I find to be a little fiddly and more difficult to grasp than a conventional T shaped arrangement. This preference applies to other diesels as well, I very much prefer a normal "tommy bar". The exhaust oil colour when running was almost clear, with just the faintest hint of amber colour in it. This indicates that it is running somewhat cool, and that it is not over-compressed or detonating. After running, the engine was noticeably cooler than when running on glow. All of this I consider very encouraging, and again similar to 1cc and smaller traditional diesels. The next stage is to get it into a small control line stunter and go flying. I will be using the APC 7x3 for flying, as ease of operation is what I desire. In any case, further testing with larger props showed that the Norvel's performance advantage over the PAW .06 only holds for the 7x3 & smaller. 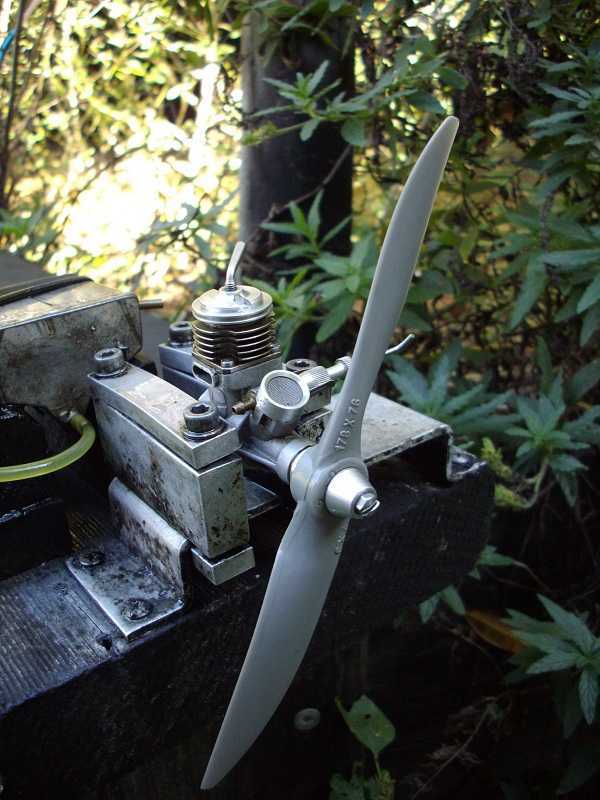 The APC 7x3 reading is about 1000 RPM more than a PAW 06 on the same prop. The MA 7x4 reading is identical to the PAW. The Norvel has a clear advantage on smaller props. Over all, I am of the opinion this is a good product and I am very happy with it. I'll provide more details once I've flown it. I will also keep this thread up to date as to the rough amount of running performed and whether the engine (conrod, crankpin, etc.) is holding up. At this stage, total running on diesel is about 70ml of fuel and maybe 15 minutes of operation. Quick follow up to this review. Last Friday (September 2), I gave the diesel converted Norvel .061 its first flights, with generally satisfactory results. The model was a flapped profile FW190 stunter designed by a friend of mine. The tank was a small uniflow, also built by my friend, which worked very well. We stuck to the APC 7x3 for flying, as this had given the best results on the bench. The reason I said the results were "generally satisfactory" was because the flying was very good, with nice consistent engine runs and no unwanted cuts in the air. However, hot restarting was not as easy as with traditional diesels. The first start of the day was actually really easy, but before launching I managed to snuff it by leaning out too far. Unlike a normal diesel, it tends to cut very abruptly when leaned, rather than warning you with rough running. I then discovered that I did not have the knack of hot restarting it, as it decided to play dead and wouldn't even blow the contra back. A bit of perseverance gave a restart and first flight, which went well despite a slightly over-lean setting with some misfiring evident in the air. Subsequent flights were better, as we found the correct setting, and by the final flight we had a setting which ran very consistently for the whole flight. A little leaning was experienced toward the end of flights, particularly with the first couple of flights before we dialled it in better. The better settings for the later flights didn't change much at all. After a few flights we were starting to get a feel for the engine, and it appears that our poor restarts were a result of minor flooding which would take a little bit of patience to clear out. When running as a glow, the .061 doesn't mind being a bit on the wet side for easy restarting, but as a diesel it looks like one choke, maybe two, is all you need. Over all impressions of the Norvel .061 diesel conversion are of a very steady running & powerful diesel that lies somewhere between a PAW 06 and an MP Jet .061 in power. On the ground it is turning around 17K with the 7x3, and unwinding somewhat in the air. It is very smooth running, and a lot quieter on diesel than as a glow running at 24K+ with a toothpick sized prop. We both decided that the style of run with the 7x3 was well suited to the model it was in. For our next flying day, I'm going to work on finding the trick to easy hot restarts, and will also try the muffler for the first time. I'll also try to get some video of it running & flying and post that. Do not operate the engine at 100%. When reaching maximum RPM, enrich the mixture by turning the needle valve counter clockwise 2-3 clicks. Trust me, I know my way around diesels. Been running 'em for over 30 years now. The engine was NOT overheated, and exhaust oil colour was not particularly dark. After landing it was already cool enough to touch - no over-temperature there. (The 061 runs rather cooler than a traditional iron/steel metallurgy diesel). The starting problems were a minor flood. Reducing the choking to one choke brought about an immediate improvement in restarting - it is simply a matter of finding what this particular engine likes. Regarding in flight settings, the .061 follows the usual rule I apply for control line diesels. Set it a touch on the rich side, and with compression toward the maximum it will tolerate, and it unloads in the air to a very good setting. You NEVER send them off peaked on the ground, because peaked on the ground will probably be too lean and will misfire in the air. Setting it works particularly well with this engine, you get an unload of maybe 1000 to 1500 RPM in flight, and it then runs the same for the whole flight. Incidentally, the handling of the .061 as a diesel reminds me of only one other engine I own - the Enya SS25D al-chro. Also a schnuerle ported engine with non-traditional metallurgy, and also runs on the cool side. Last Edit: 7 years, 7 months ago by . I was looking for a new small diesel to power a new Old Timer project but these engines are difficult to find new. The idea of using an NV BigMig converted to diesel appealed to me as I have been using these engines for control line and find them to be reliable and powerful engines. The diesel heads and new BigMig 061 RC engine I ordered arrived last week. I ran in the engine with the glow head before I swapped the diesel head in. Below is the link to a video clip I made of the bench test. I am more than pleased with the performance of the engine. Unfortunately, I do not have any tach readings as my tach decided to behave badly on the day - probably due to a weak battery.